Could a primary opponent cause a headache for Roy Blunt? JEFFERSON CITY, Mo. – Republicans and Democrats have already began to float their names and fill in slots for the myriad of statewide races that will be on the ballot next fall. But in one race – the fight against U.S. Sen. Roy Blunt – candidates have not yet emerged. Jefferson City common wisdom is that the powerful Republican, who serves in Senate leadership, is politically too big to fail, particularly against a Democrat who has yet to announce. But if a primary campaign was launched, would he really be unbeatable? Over the weekend, the Remington Research Group — a polling firm owned and operated by Kansas City Republican consultant Jeff Roe – surveyed 1,355 likely 2016 primary voters. The survey found that Blunt – an establishment-type conservative who made it through the Tea Party revolution in 2010 with minimal primary opposition – received 60 percent of the likely primary vote, while St. Louis businessman John Brunner – a staunch conservative who ran unsuccessfully for U.S. Senate in 2012 – received 40 percent. As a sitting senator, Blunt is in the news each day, and his name is more likely than Brunner’s to be fresh on the minds of likely Republican voters. Brunner’s is not, and that gives Blunt an advantage. The polling summery obtained by PoliticMo did not say who commissioned the poll, and the summary does not put Blunt and Brunner against a third category, “undecided,” a factor typically included in Roe’s polling. Blunt, this operative said, will be financially ready for the fight (in his last report filed in September, Blunt had nearly $1.8 million on hand, and he has been raising money since). 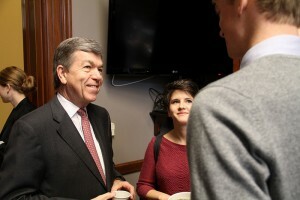 “Senator Blunt is home a lot, he’s engaged in major national debates like Keystone, immigration, and health care, and he has a smart operation that is very engaged and ready for 2016,” the operative said. Brunner, a former marine whose company, Vi-Jon, produced Germ-X, has been communicating with donors and political consultants about a statewide run in 2016, but has not yet pulled the trigger on any particular race. The same survey found the Republican Party’s only gubernatorial candidate vulnerable to a primary opponent. Catherine Hanaway, the former House Speaker who announced her campaign last February, pulled 44 percent against State Auditor Tom Schweich, a Republican received 56 percent in the survey. While Hanaway is the only candidate to have announced her candidacy, Schweich – who has not been subtle about his interest in the seat – was on the ballot in 2014. He ran television and radio advertisements, and traveled the state last year in the lead up to that race, where he ran unopposed. Even with a Schweich announcement pending, it is not clear that the field would necessarily be set with those two candidates. If former Republican nominee Dave Spence is thrown into the mix, for example, the survey found the spread more uneven. In the hypothetical matchup, the Remington Group found Spence receiving 25 percent, Schweich receiving 37 percent, and Hanaway receiving 39 percent — virtually tied with Schweich. The majority of the voters polled supported reforms to the state’s laws and some type of Medicaid expansion, but were equally split on campaign contribution limits and requiring law enforcement officials to wear body cameras.